Everybody needs plenty of shoes. You never know what mood you may be in and what pair/style you may require for the days' antics. I've pictured some of my favourite/most worn pairs from my ever growing collection; basically my core, couldn't-live-without-them-wear-them-to-death shoes. I'm one of these annoying people that likes the real deal when it comes to footwear hence all the brands (yes I know I don't have real Litas..yet), but I really think that footwear is one of the few things where you really get what you pay for! I haven't always been a shoe-fiend, in fact I used to just live in one pair of Converse; it's only recently that my appetite for footwear has grown. 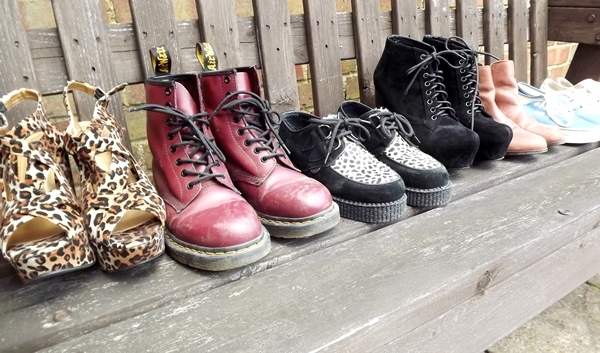 At the moment I'm wearing my creepers and Dr Martens the most - what shoes do you never take off? My docs! They're my fav and super comfy! I love my glitter boots too, as well as the kori off the chain alexander wang. Your shoes collection is fab! Love those! What an interesting post :) i never take my creepers off aha! Great post Amy. I agree, footwear is where you get your moneys worth. I have recently got my appetite wet for shoes. I have bought 2 pairs in a week. I never take of my boat shoes, black boots or studded loafers! This is a great post, I love it! I'm the exact same when buying shoes and wanting the real deal, I definitely think they're worth it (unfortunately for my bank account). I'm never out of my Converse, I must have about ten pairs now after 'collecting' them over the years! Slight obsession, but so comfortable. My Vans, I wear them everywhere and anywhere but really need to break the habit! haha. I am a new follower to your blog, if you could return the favour that would be amazing. This is a very impressive collection of shoes!